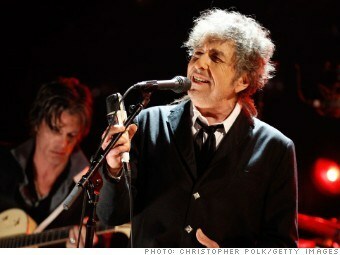 Sony Music's decision to issue an extremely limited edition of what immediately became one of the most highly collectible Bob Dylan recordings ever -- including many rare bootlegs -- reveals the essential, and possibly intractable, problems of protecting intellectual property in the Internet age, as well as the clumsy approaches to copyright policy by governments around the world. It also reveals what looks like a bit of a flub by Sony (SNE). Sony is releasing the CD because the European Union's copyright laws are changing. The life of copyrights on recorded works will be extended to 70 years from 50 years, but not until 2014. So works recorded in 1963 and before, but not yet published, are in danger of being stuck under the old copyright regime, which the record labels have fought hard to extend. The 86 Dylan tracks on the album are studio outtakes and live cuts from 1962 and 1963. They would have gone into the public domain if Sony hadn't released them. "This isn't a scheme to make money," a Sony Music source told Rolling Stone, stating the obvious. (Sony's bottom line wouldn't be helped much by selling 100 CDs at between $40 and $140 apiece, depending on the country of sale.) Under the new law, "there's a new 'Use It or Lose It' provision," the Sony source said. And since the company didn't want to release any Dylan material so soon after his recent album Tempest was released, this seemed like the best solution. "The whole point of copyrighting this stuff is that we intend to do something with it at some point in the future," the Sony exec told Rolling Stone. There are "other things we want to do in 2013, though." The music is also available on Dylan's Sony-managed Web site, but only to people signing onto the Internet from Germany and France. But people really want the CDs. A copy of the album sold on eBay for more than $1,400. The copyright extension means that the earliest works of some of the rock era's biggest stars are entering the public domain, while their later works will continue to make money for whomever holds the copyrights. Dylan's first album, Bob Dylan, which got little notice when it was released in 1962, went into the public-domain in Europe this month, meaning that anyone in Europe may use the recordings for any purpose they like without having to pay royalties. Also entering the public domain this month was "Love Me Do," the Beatles' first single. But artists like Dylan and the Beatles will continue to collect royalties on most of their later music, thanks to the extension. But more to the point, the music labels will benefit, too. They lobbied hard for the extension, which passed into law in 2011. The beneficiaries will mainly be the labels and the most popular (and therefore, richest) artists of the era. Artists who were popular at the time, but no longer are, will see little benefit, if any at all. But Mick Jagger can breathe a sigh of relief. "Obviously the record business is not what it was, so people don't earn as much as they used to," Jagger told the BBC more than a year ago when the law was signed. The royalties "can extend their lives and the lives of their families who inherit their songs." So maybe the Rolling Stones won't have to do a 60th anniversary tour in 2022 after all. Another issue with the limited release of the new Dylan album: it has inevitably led to widespread Internet piracy, which is already sapping the value of the material. So when it's released more widely in the future, it will make less money for both Dylan (or his heirs) and Sony. Of course, that's better than making no money at all, as would have happened if it weren't released in time. But that simply reveals a bit of clumsy management: if the music were widely released, say, a year ago, this wouldn't be as big a problem. Fewer people would feel compelled to download illicit copies. But clumsy management is nothing new when it comes to Dylan's recorded output. He has been called the most bootlegged artist in history. The first-ever well-known bootleg was of Dylan music, on The Great White Wonder, which began circulating in 1969. That album was made up of recordings Dylan had made informally with The Band in a house in West Saugerties, N.Y., in the late 60s. Columbia Records, his label at the time, later acquired by Sony, tried to counteract the bootleggers in 1975 by issuing a pseudo-bootleg of its own of some of the same material, calledThe Basement Tapes. But they muffed it: the official album contained only a tiny portion of what was recorded in the basement, and it didn't even represent the best material. Illicit copies of the remaining, superior cuts continued to circulate in big numbers (and still do today, online and in the real world). It wasn't until 1985 that Columbia released some of Dylan's vast piles of unreleased material, on an album called Biograph. Starting in 1991, the company has issued nine volumes of previously unreleased music under The Bootleg Series. A 10th volume consisting of what's on The 50th Anniversary Collection would have meant that Sony would have extracted far more value than it will be able to now. Rather remarkably, The New York Times advises: "For collectors who want the recordings, but who don't care about having one of the 100 original CDs, the set has been turning up on file-sharing sites." And indeed, a look at Pirate Bay and other file-sharing sites shows that the album is being downloaded all over the place. Some people would have downloaded it even if it were widely available. But how many would have otherwise purchased the album if only Sony thought to have it ready in time?